Revenue in the Banner Advertising segment amounts to US$16,898m in 2019. Revenue is expected to show an annual growth rate (CAGR 2019-2023) of 5.2%, resulting in a market volume of US$20,705m by 2023. Banner advertising is one of the most common forms of digital advertising. Banners come in various shapes, sizes and formats and are displayed on a website accessed via desktop PCs or on a mobile-enabled website or in an app. Typical formats are e.g. skyscrapers, wallpapers, interstitials or pop-ups which usually link to a landing-page of the advertiser. In addition to these static banners so-called rich media banners allow playing sounds, animations or videos. Videos which are displayed instead of a static banner outside of a certain video player are considered Rich Media. Overlay advertisements and pre-roll, mid-roll, post-roll video ads within web- or app-based video players are no banners, but are categorized as video advertising. Reading Support Ad spending in the Banner Advertising segment amounts to US$16,898m in 2019. Reading Support The Banner Advertising segment is expected to show a ad spending growth of 6.5% in 2020. 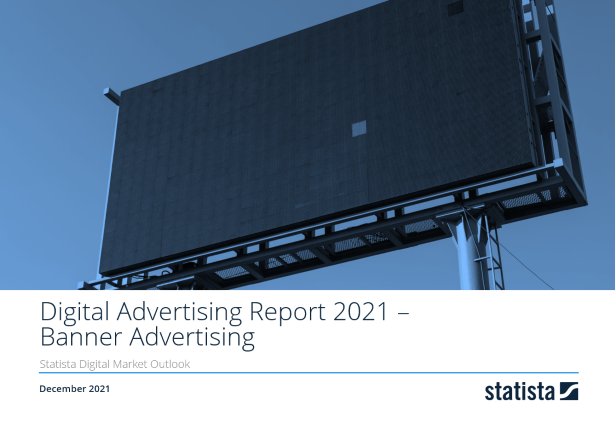 Reading Support With a market volume of US$25,802m in 2019, most ad spending is generated in United States. Here you can find more studies and statistics about "Banner Advertising".